I have discovered that the gelliboard makes a great base for stamping..
oohh that looks interesting, and what lovely colours. Great wrapping paper. The lizard one is especially fab! I love your wrapping paper designs, but what is a gelliboard? So cool I love this idea! Found you at Sew Darn Crafty. Looks lovely, gorgeous colours and yes, I would like to know what a gelliboard is please. Hope you have a good week. I've nev heard of gilliboard but it looks amazing! 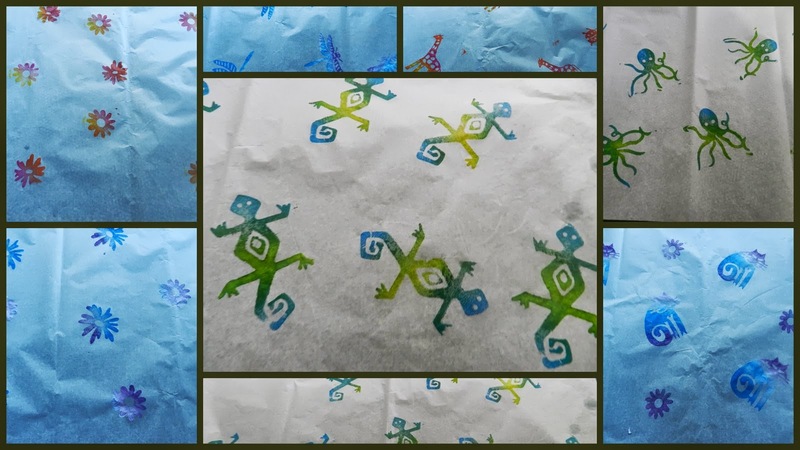 Lovely wrapping paper, what a great idea to make your own. It looks so cool - and fun! interesting, perhaps a little more info on this technique. i like the lizard design, lovely! What an amazing process! never heard of gelliboard - what are the coloured blobs made from in the first picture?